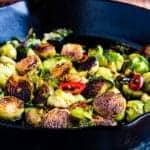 Pan-seared Brussels sprouts in a sweet-savory soy glaze are truly one of the best things ever. “Spiteful little cabbages” is what an old friend of mine used to call Brussels sprouts. The name still cracks me up, even though I find these leafy little bulbs to be more delightful than spiteful.